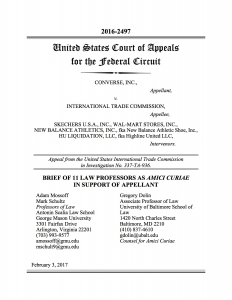 Last June, in Converse v. ITC, the International Trade Commission (ITC) found that Wal-Mart, Skechers, and New Balance, among others, could copy an athletic shoe design – Converse’s Chuck Taylor – because it lacked “secondary meaning” to consumers, and therefore failed to qualify for trade dress protection under the Lanham Act. In trademark law, secondary meaning arises when consumers come to identify a mark (or design) with a specific product. The ITC concluded that since similar designs had been available for years, the Chuck Taylor shoe did not exist in consumers’ minds as special and distinctive. Why, you may ask, should a ruling about “secondary meaning” – a seemingly arcane dispute that only lawyers could love – matter to consumers, especially since it frees up the competition? It matters a lot, since it departs from fundamental policies of trademark law that protect consumers. According to the ITC, copiers of this iconic shoe, which has sold hundreds of millions of pairs over the past eighty-plus years, may now flood the market with look-alikes. Consumers do not benefit from competition that is not based on actual competitive advantage. Producers who have sought to earn customers’ allegiance are equally hurt. The ruling distorts the whole idea of how trademark law seeks to protect producers who have worked hard to ensure that their products benefit from goodwill. Converse demonstrated consistent efforts to promote goodwill towards the Chuck Taylor design; the decision ignored the shoe’s iconic status in American culture; Converse’s massive investment to maintain its status over several generations; not to mention that Chuck Taylor is the best-selling shoe of all time. Because this decision threatens to upend the law’s settled objectives, eleven law professors, including Prof. Hugh C. Hansen, have filed an amicus brief asking the Federal Circuit Court to reverse it. When the ITC cited the existence of similar designs, it made no effort to evaluate what, if any, impact they had on consumer perceptions – a flaw that effaced the element of meaning from “secondary meaning.” It was as if the mere existence of copies, irrespective of how they affected consumers’ choices, was all that mattered. In the brief, the professors argue that the name and design of these shoes exemplifies the successful commercial goodwill that trademark law is intended to secure to innovative entrepreneurs. The ITC ignored the importance of investment in goodwill to trademark law and, more specifically, to the establishment of “secondary meaning.” It viewed the issue solely from the consumer’s perspective – as if that were the only perspective – without appreciating how consumer and producer interests are intertwined. It failed, in other words, to recognize that trademark law does not just protect consumers from the brand confusion, but also secures the goodwill of producers who design and market quality products. These are mutually reinforcing policies, and unite the interest of consumers and trademark holders. The ITC’s assessment of factors that serve to prove secondary meaning wrongly submerges Converse’s investment in the goodwill associated with the Chuck Taylor design. By examining only surveys and the fact that consumers have encountered knock-offs, the ITC cuts secondary meaning off from its roots in goodwill. Fundamentally, the ITC failed to understand that goodwill in a product benefits the public as an example of long-standing product quality guaranteed by the true source. 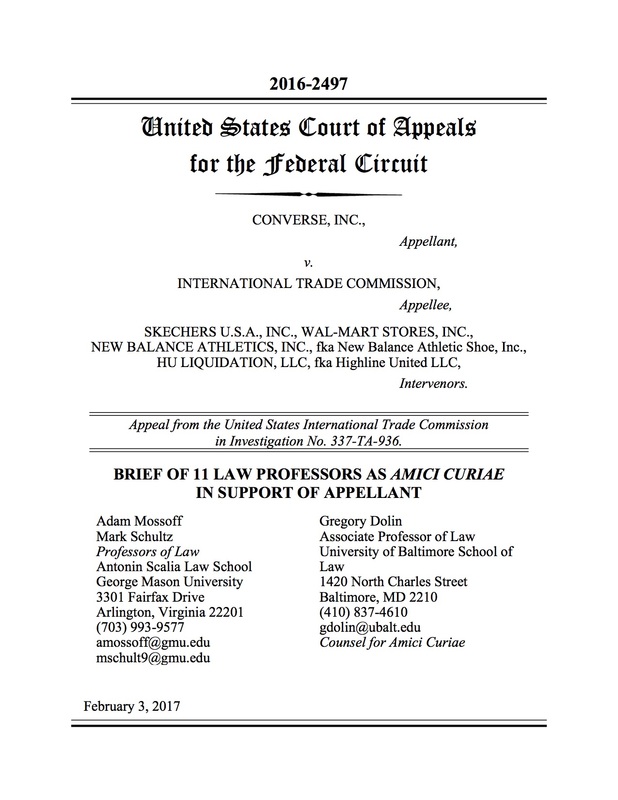 In the view of the amici law professors, the Federal Circuit should restore the meaning of “secondary meaning” by requiring that tribunals take account of goodwill by actually measuring its effect on real consumers. Anything less is a disservice to the purpose of trademark law as an arbiter of authenticity in the marketplace. Consumers need trademarks to distinguish genuine from pirated products, and producers who create goodwill are vital to maintaining the affinity between consumers and quality brands.